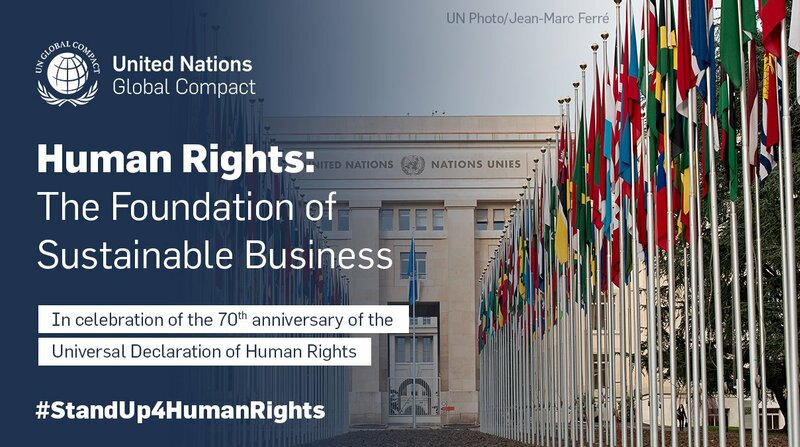 GENEVA, November 26, 2018 /3BL Media/— In celebration of the 70th anniversary of the Universal Declaration of Human Rights, the United Nations Global Compact has released a new report — Human Rights: The Foundation of Sustainable Business — showcasing opportunities for businesses of all sizes and sectors to strengthen and scale up their efforts on human rights. The report also presents snapshots of how the UN Global Compact has worked to elevate and scale its engagement with business in the area of human rights in the lead up to the 70th anniversary — ranging from working with the UN Global Compact Board to stand up for human rights, to hosting training sessions on the Academy learning platform including with the former High Commissioner for Human Rights, to convening human rights-focused CEO Roundtables around the world. As a special initiative of the UN Secretary-General, the United Nations Global Compact is a call to companies everywhere to align their operations and strategies with ten universal principles in the areas of human rights, labour, environment and anti-corruption. Launched in 2000, the mandate of the UN Global Compact is to guide and support the global business community in advancing UN goals and values through responsible corporate practices. With more than 9,500 companies and 3,000 non-business signatories based in over 160 countries, and more than 70 Local Networks, it is the largest corporate sustainability initiative in the world. For more information, follow @globalcompact on social media and visit our website at www.unglobalcompact.org. Join the conversation with us on social media by using the hashtag #StandUp4HumanRights.